Populous, a New York-based firm specializing in stadium design, recently entered its development phase on its winning concept for a soccer stadium in Monterrey, Mexico. Because of the continuous curves of the stadium, even minor adjustments in the form demanded a whole series of changes throughout the model. For example, a re-articulation of the exterior roof line might also affect the width of the gill-like openings on the sides. With over a hundred slits, it’s a lot of tweaks. With over a decade of combined experience in advanced scripting, Parsons and his partner, Gil Akos, have found their niche where digital design and programming intersect.Many of their clients are other architects who need to automate some of their processes to allow for more time to design. 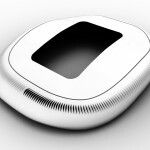 Their solution for the Monterrey stadium was to build parametric features into a NURBS model.In Mode’s parametric concept model, the user can make one modeling action and create global changes throughout the design.Raise the stadium dome, and it ripples with varying curve differentials; extend or compress the skin, and all the gills breathe in and out, all at the same time. Akos and Parsons employed a new strategy on the Monterrey project that is proving to make project-specific design tools more effective and easier to use than ever before. Ordinarily, Akos and Parsons could achieve a flexible Rhinoceros model through programming alone. This time, however, they tested out the newly released parametric module for Rhinoceros called Grasshopper. Grasshopper creates a middle ground between the 3D model and the logical rules that describe it. 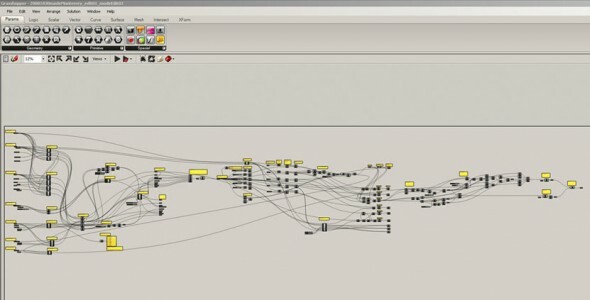 The Grasshopper interface, which resembles a 2D wiring diagram, displays each individual modeling action as an object (a flowchart-like rectangle), linked to other objects containing parameters, like widths, heights, and radii. 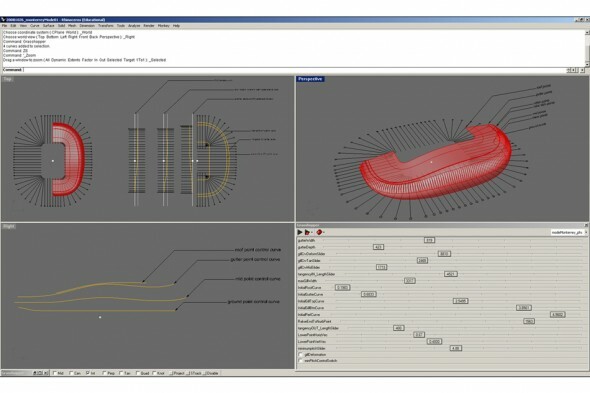 Users can change the shape of the 3D model by locating a parameter object in the diagram and typing in new numbers. Or, as Mode did for Populous, a user can add in graphic sliders for a range of values, or toggle-switches between two fixed parameters. Because of this interface, parametric features in Populous’ stadium design tool are intuitive to locate, understand, and operate. There have been of course 3D software centered around parametrics. A major problem with these parametric modelers was they didn’t particularly lend themselves to intuition. If you did not build in the parametric controls yourself, it was hard to figure out which features were adjustable, and how to access them. To make matters worse, if you wanted to adjust a feature that was outside the parametric scheme, you might lose the time-saving advantage by having to deconstruct and reconstruct the model. With a visual layout of the parameters and more user-friendly controls, Grasshopper manages to sidestep these old problems, opening up new collaborative possibilities. According to Parsons and Akos, Populous has used their flexible concept model through four months of development work, varying the stadium’s form to match up against the matrix of real-world constraints. “The stadium was the first application of Grasshopper on a real building-scale project.It was a bit of trial and error,” admits Akos. Much of Mode’s time on the Monterrey project was not so much building the model, but assessing the needs of the client and determining what variable capabilities the model needed. As the stadium development goes on, he sees even more potential for shortcuts than he did on the outset. Meanwhile, use of Grasshopper has entered into many other new Mode programming projects. “One thing we are looking into now is actually building some analysis into a Grasshopper model so we can work through surface subdivision, planarization, analysis in terms of color shading, and such things as solar gain,” says Parsons. Given the fact that the first draft of concept rarely is the one that is actually built, custom design tools may soon become a more common occurrence, now that there is an accessible platform to support them — and a design office that specializes in creating them. Mode is a design office that leverages computational expertise through design research, teaching, and consulting.Mode utilizes diverse methodologies including code, associative and relational strategies, as well as digital fabrication in the production of material organizations and the formation of space.Mode is located in Brooklyn, New York.For more projects, please visit: www.studiomode.nu. For designers who are exploring new shapes using generative algorithms, Grasshopper™ is a graphical algorithm editor tightly integrated with Rhino’s 3-D modeling tools. 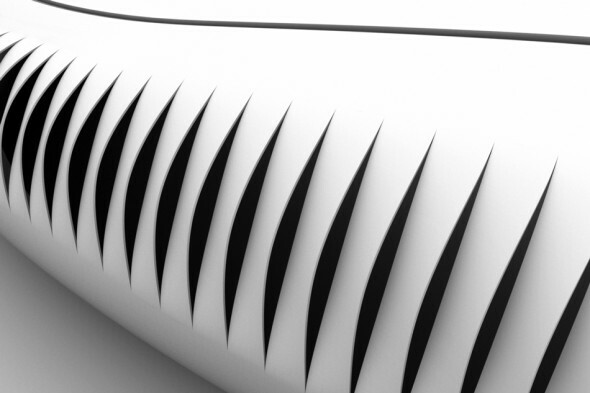 Unlike RhinoScript, Grasshopper requires no knowledge of programming or scripting, but still allows designers to build form generators from the simple to the awe-inspiring.For more information, please visit: www.grasshopper.rhino3D.com.